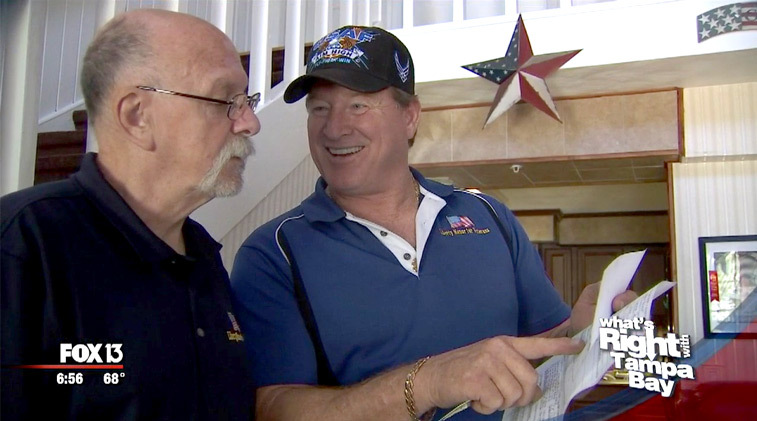 TAMPA (FOX 13) – Veterans who have sacrificed so much for our freedom need help from time to time. Nobody knows that better than Connie and her husband, David Lindsay. David tells stories of his father’s war service to veterans at Liberty Manor – a home for homeless and disabled vets. “We don’t want them to be hungry, hot, or cold ever again in their life,” Connie Lindsay explained of the Manor’s mission. Connie and her husband Dave run Liberty Manor. The Lindsay’s use their own money, plus donations to support the program, which costs approximately $1,000 a month to operate. “They did a service that I am not willing to do. That’s why I show so much homage to them,” Connie said. Authur Gardiner spent more than three years in the Navy. When he got out, he lived in New York until he retired and came to Tampa to live with his son’s family. “Couldn’t stay with my son and daughter-in-law and their kids. It was too tight,” Authur said. Then he found out about Liberty Manor. “You expect family to care. I care about my family no matter what, but when somebody on the outside actually cares and does things for you, it makes a big difference,” Authur said. That’s something the Lindsay’s take to heart. “While all of us were achieving our college degrees they were fighting a war for us and continue to fight for us,” Connie said. The Manor has been around for 11 years and has helped hundreds of vets. For more information, visitwww.libertymanor.org.